This knife dates from the first half of the 16th century and is probably Italian. Its blade is engraved with musical notes and blessings to be said before and after a meal. Knives with musical notes on the blades are known as notation knives. A notation is the written version of a physical process, such as the sound of music. Once it is written down it can be preserved and recreated. 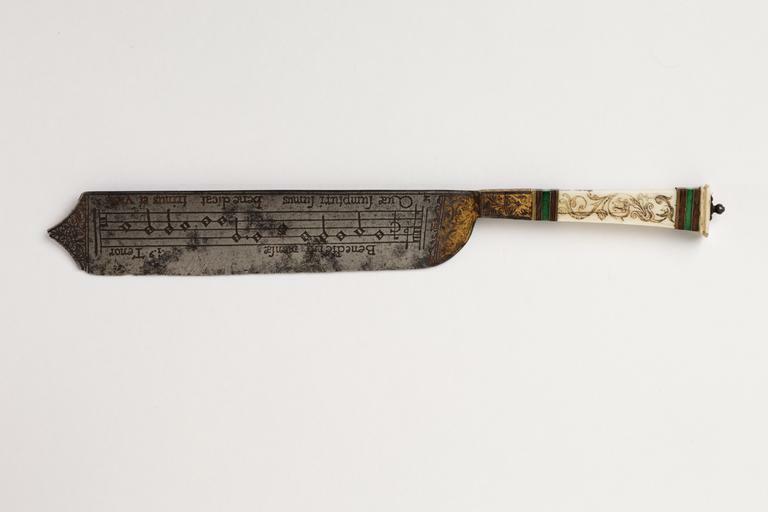 This knife is etched with notations expressing gratitude for a meal. On one side of the blade the inscription translates as, ‘The blessing of the table. May the three-in-one bless that which we are about to eat’, to be sung before the meal is taken. On the other side the notation gives thanks after the meal: 'The saying of grace. We give thanks to you God for your generosity’. The point of the knife allows meat or bread to be skewered and offered to a fellow diner. Notation knives are extremely rare. Serving knife. The broad, steel blade ends in a triangular point and has etched decoration of leaf scrolls at each end. The blade is engraved with graces to be sung before and after meals. The handle is ivory, tapering away from the blade and rectangular in section and has engraved leaf ornament emphasised with black infill. The finial on the handle has bands of ebony and brass, with a silver knob. Quæ sumpturi sumus bene dicat trinus et vnus. The Museum bought this knife as Lot 23 from a sale of "An Interesting and Valuable Collection of Objects of Vertu of the 16th, 17th and 18th Centuries and old chinese Porcelain, Formerly the Property of a Gentleman" by Christie, Manson & Woods, 8 King Street, St. James' Square on Tuesday 21st April 1903. A minute of 18 April 1903 signed A.B. Skinner recommends the purchase of this knife among several items of cutlery describing it as "being of extreme rarity" and likely to "fetch a high price". The agents through which the knife was sold, Durlacher Bros. of 142 New Bond Street, estimated it would fetch £60 although the Museum secured it for £25.7s.1d (including agent's fee). The provenance of the knife until 1903 is not known. "Three knives from the same set in the Foulc Collection, Philadelphia Museum. Another (?one of these) illustrated in L'Art pour tous, Vol. XII (1873), No. 307, p. 1228: in collection of 'M. Allain de Pont l'Eveque'." "Two others were sold in the Bourgeois Freres Sale, Cologne 1904 (Cat. Vol. I, No. 867). Another knife with a similar blade but different handle was in the Spitzer Collection (Cat. Vol. III, P.239, No. 144). All appear to be French (c.f. Museum knives nos. M604, 624, 627-1710; 2132-1855)"
A further handwritten note by Claude Blair, former Head of Metalwork (1974-82), says, "Another knife is in the Municipal Museum, The Hague. CB." Knives with musical notes on the blades are known as notation knives. A notation is a mechanism by which a physical process, such as the sound of music, is written as a set of symbols so that it may be preserved and recreated. This knife is etched with notations expressing gratitude for a meal. On one side of the blade the inscription translates as, ‘The blessing of the table. May the three-in-one bless that which we are about to eat’, to be sung before the meal is taken. On the other side the notation gives thanks after the meal: 'The saying of grace. We give thanks to you God for your generosity’. The point of the knife allows meat or bread to be skewered and offered to a fellow diner. Dennis, Flora. Scattered knives and dismembered song: cutlery, music and the rituals of dining. Renaissance Studies, February 2010, vol. 24.1. pp.156-184. [Part of a special issue: Peta Motture and Michelle O'Malley, eds, Re-thinking Renaissance Objects: Design, Function and Meaning. Knives with musical notes on the blades are known as notation knives. This one is etched with the first tenor's part of the blessing of the meal (to be sung before) and the giving of thanks after.